The Tactical Reponse Pack is ideal for all tactical, search and rescue operations. Available in three colors, the pack is very durable, lightweight yet compact! One large clear vinyl panel can organize airways, instruments, O2 equipment, etc. and can easily be removed and replaced by VELCRO®. Tacked loops under the panel are also provided. The pack also has two clear removable field packs (one large 11"L x 3"W and one small, 5 1/2"L x 3"W), two additional zippered mesh pouches and two large side/body pockets. "C" or "D" tanks are securely held with a hook and loop system. High density padding is used for back support. 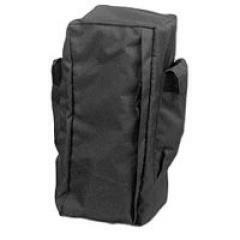 Includes carrying handle, tuck away straps and waist belt for additional stability. Made of 1000 Denier nylon. Dimensions 23"L x 12"W x 9"D.